Coach Mike Small has insisted that the last four seasons have been the best in the history of the Illini program, and there’s no arguing that point after what has happened in the last few weeks. The Illini trailed Iowa going into the last round of the Big Ten tournament but came back to win with a strong showing in the final round. The same thing happened in the NCAA regional at Whistling Straits in Wisconsin and, still again, in Monday’s final round of the NCAA finals at Eugene Country Club in Oregon. With only the top eight teams advancing to the match play conclusion to the tournament the Illini rallied again. Illinois was tied for ninth after 54 holes but three of the five Illini players– Thomas Detry (67), Dylan Meyer (69) and Nick Hardy (69) — bettered par in the final round as the Illini rallied for a second-place finish. Charlie Danielson, was the top Illinois player in the individual standings, finishing in a tie for eighth after a 1-over 71 on Monday. Only Texas – with Arlington Heights product Doug Ghim among its players – could top the Illini in the 72-hole portion of the championship and the Longhorns – unlike the Illini – survived the first day of matches. Illinois beat South Carolina 4-1 in the quarterfinals but lost 3-2 to host Oregon in the semifinals on Tuesday. Oregon, led by NCAA individual champion Aaron Wise, will face Texas for the title on Wednesday. Next year the NCAA finals will be played at Rich Harvest Farms in Sugar Grove. The first of Chicago’s two pro tour stops of 2016 begins on Monday with two qualifying rounds for Web.com Tour’s Rust-Oleum Championship. Eliminations at both Pine Meadow, in Mundelein, and Stonewall Orchard, in Grayslake, will off six berths in the $600,000 tournament proper at Ivanhoe Club. Monday’s program also features a celebrity pro-am that tees off at noon at Ivanhoe. On Tuesday there’ll be a practice day plus the first local qualifying round for next year’s Drive, Chip & Putt competition and a final pro-am will be held on Wednesday before the 72-hole, four-day tournament proper begins on Thursday, June 9. Entries into the 156-man starting field for the $600,000 competition close at 5 p.m. on Friday. The Web.com Tour is competing this week at the Corales Puntacana Resort and Club Championship in the Dominican Republic. Two Chicago area players – Vince India and Joe Affrunti – are in the field there. 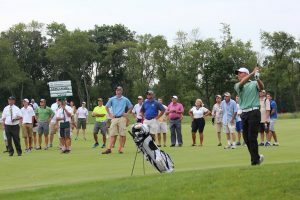 A handful of local players will be among the nearly 600 participating in Monday’s 10 sectional qualifiers for the U.S. Open. Those 36-hole tests will determine who plays in the Open proper June 16-19 at Oakmont, in Pennsylvania. Survivors of the HOW MANY local eliminations have their choice of sectional sites. While the U.S. Golf Association again bypassed Chicago as a sectional site, the area did host two locals at both Village Links of Glen Ellyn and Exmoor, in Highland Park. Two of the top local players, though, chose to compete elsewhere. Tee-K Kelly, the two-time Illinois Amateur champion from Wheaton, got through the local with a tie for third at Rattlesnake Ridge, in Ohio, prior to competing as an individual in the NCAA Championships. Libertyville’s Michael Schachner, an invitee to the Rust-Oleum Championship to be played as his home club, was medalist in the local at Bishops Bay in Wisconsin. Northbrook’s Tim Puetz also advanced to sectional play at Bishops Bay. The Arlington Heights Park District is opening registration Wednesday (TODAY) for players wanting to play in the July 1 re-opening of the Arlington Lakes course. It’s been closed for over a year to undergo a renovation. Japan club manufacturer XXIO will host a demo day from 1-5 p.m. on Friday at Cog Hill, in Lemont. John Platt gave Mistwood’s professional staff another title last week when he defeated Craig Carney of Bull Valley in the final of the Illinois PGA Senior Match Play Championship at Shoreacres in Lake Bluff. The downstate team of Tom Kearfott, of El Paso, and Tim Sheppard, of East Peoria, won the new Chicago District Golf Association Senior Amateur Four-Ball tourney last week at Crystal Tree in Orland Park.